I've had this coat for a long time. Everyone I know who's seen it for the past 6 years has bemoaned the fact that I still have it, let alone still wear it. Well, to all the haters...I caved. I got a new coat. Go on ahead. Soak it in. Note that the cuffs are a little taut. This coat has gone through the dryer one too many times. But it's such an old coat, it needed the washing (just not the drying). Now take a look at the zipper. Not the pocket zipper, but the main one. Can you see the zipper a little bit? No, I guess not. I didn't take a good photo. Imagine you were wearing this jacket (I know you want to). Imagine which hand you would use to pull the zipper up if you were a guy. Guys' zippers are always on one side. Ladies' zippers are always on the other. Think about it. Guys' zippers are on the right as you're wearing the jacket. But this zipper is sewn on as if it were a woman's jacket!!!! I noticed it years and years ago, so I was consciously wearing the jacket, even with its design flaw. Anyway, this jacket has been with me through thick and thin. Year after year. 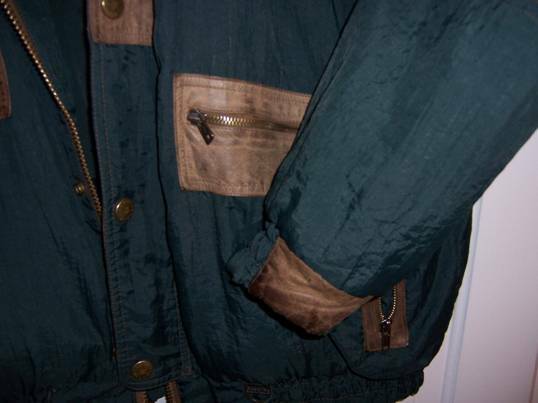 I used to cart wood in this coat - tons of wood to heat the house. 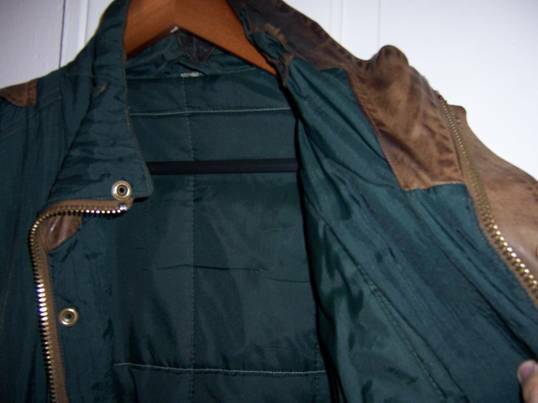 It was my only winter jacket until I got a warmer jacket in 1997 (I still have that one, too, but at least it's more stylish, and is still in style). I wore it all the time. 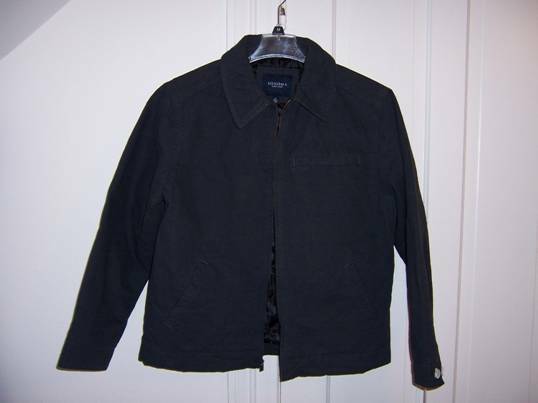 Well, I went away to school, and the years rolled by, until all of a sudden, in 2002, the official DimeBrothers' mother started hounding me about why I had this jacket. "Get rid of it," she said. "It's terrible." "Nah," I told her. "It's an awesome jacket, and there's nothing wrong with it!" Repeat dialogue, ad infinitum. 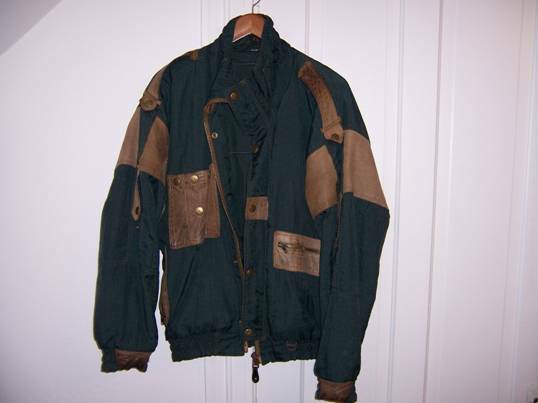 Every year, sometimes biannually, my mother would ask me to part with the jacket. Starting in 2006, the official DimeBrothers' father pitched in with his own two cents: "Get rid of it." But it just wasn't family hounding me. I started to share the coat's saga with friends and girl friends. They pleaded with me unsuccessfully to cast away this beautiful specimen of early 90's textile fabrication. 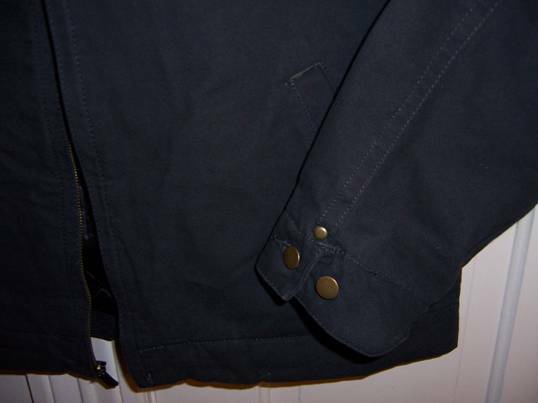 The coat began to have its own persona. Surely this coat would hang in my presidential library after a long and productive career serving the public. The historical society pondered lobbying the state legislature to make my closet a historic district. A forensic archaeological team began preparations to conduct a phase III study to uncover what must surely be historical remains underneath the coat. But it was not all downhill for the coat. Also in 2006, I was given hope that the 30-year fashion cycle had doubled nits pace and my coat was again in fashion after only 15 years. Twice in two months at a local grocery store, a woman well on in years and most assuredly sage, commented that I was wearing a nice jacket. Twice!! Proof that I was not alone in my fight to stay loyal to the coat. Alas. This year, something just didn't click. The coat hasn't made it out of the closet even once. I believe all the pressure has finally gotten to me. Also, with a new job, I have to seriously consider whether wearing my coat would actually impede my move up the career ladder! 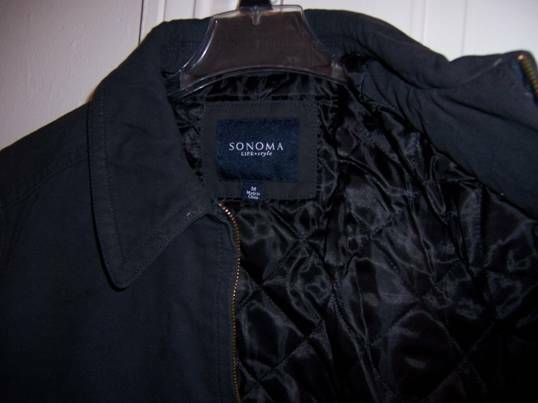 So I was in Kohls a couple weeks ago, and saw a beautiful Sonoma jacket that had all the qualities I was looking for: an anti-static interior, no hood, simple design for long-lasting style, and, most important, a man zipper. They didn't have my size, but the price was classically Kohls: marked down from $70 to $28. So I ordered my size online and it arrived today. I love my new coat and invite you to share in its goodness. Take a look. Go ahead. Soak it in. See the zipper on the right?